This year marks the twentieth anniversary of the adoption, in 1989, of UN General Assembly Resolution 44/27 on “International Solidarity with the Liberation Struggle in South Africa”. This was one of numerous resolutions by the General Assembly in which the nations of the world pledged their support for the eradication of apartheid. Within months of the adoption of this important resolution, the South African liberation movements were unbanned. Nelson Mandela and other political prisoners were released. The stage was thus set for the negotiations that would eventually lead to the achievement of freedom and democracy in our country. Since the advent of democracy in 1994, we have built a solid, stable democracy, founded on the principles of unity, non-sexism, non-racialism and democracy. As we continue to build our young nation we are cognisant of the need for a conducive international environment. It is for this reason that we are committed to play our part with the rest of the international community to take forward the fight against poverty and to respond to the crises that are confronting the world today. We must act now, together, to halt the degradation of the environment. We must act now, together, to prevent the global economic crisis from undoing the gains that we have achieved over decades. The eradication of poverty must remain central to the work of the United Nations. It must continue to work harder to unite the world to work to alleviate the suffering of the world’s poor and marginalised. The global economic meltdown has dealt a heavy blow to world efforts to eradicate poverty. But it should not diminish our resolve. The United Nations must play a significant role in finding solutions to the global economic crisis. The crisis should not be an excuse to delay further action on the delivery of the Millennium Development Goals (MDGs). Rather, it should urge us to double our efforts to achieve greater and faster progress. Developing countries did not cause the economic crisis, but they are severely affected by it. The crisis has further highlighted the urgent need for the fundamental reform of the Bretton Woods institutions, including their mandate, scope, governance and responsiveness. These institutions have been unrepresentative since their formation a half century ago. The current arrangements are inadequate and unfair. They do not reflect the changes that have taken place in the global economy. We should ensure that the election of the heads of all these institutions is more democratic, and opens opportunities to developing countries. The emerging and developing economies, including the poorest, must have a greater voice and greater participation in these institutions. Similarly, if we are to eradicate poverty there is an urgent need to conclude the Doha Round of trade negotiations in a manner that prioritises development. We continue to work for an African renewal, and welcome the ongoing support of the UN system in addressing the challenges facing the continent. Now more than ever, it is necessary for the United Nations to ensure that the international community collectively implements the commitments made to Africa. We have a viable socio-economic development blueprint, the New Partnership for Africa’s Development (NEPAD), which should be used in mobilising resources for Africa. We appreciate that there can be no lasting peace without development, and no development without security. Over the last 20 years, Africa has made much progress in working to end conflicts and to promote democratic practices and institutions. However, some pockets of conflict persist. For its part, South Africa has been engaged in mediation, conflict prevention and peacekeeping on the continent in, among others, Burundi, Zimbabwe and the Democratic Republic of Congo. The African Union (AU) has the political will to resolve conflicts on the continent. However, it lacks resources to run effective peacekeeping interventions and conflict prevention mechanisms. We appeal for support for African peace making efforts, and for greater cooperation between the UN and the AU. In this regard, we call on the UN General Assembly to align itself with AU and SADC resolutions that do not recognise governments that come into power by force or other unconstitutional means. The search for global peace, stability and security cannot be separated from the pursuit of justice, self-determination, human rights and economic development. We need to constantly reaffirm the inalienable human rights of all people. We call for the full and effective implementation of the outcomes of World Conference against Racism and the subsequent Durban Review Conference. It is of concern that at the close of the first decade of the 21st century there are still nations that find their lands occupied and their people oppressed. We are convinced that urgent and concrete steps are needed to resolve the situation in Western Sahara. We must work with similar urgency towards the achievement, through negotiations, of a peaceful co-existence between Israelis and Palestinians. This must be based on the creation of a viable Palestinian state, existing side-by-side with Israel, within the 1967 borders, which are secure and internationally-recognised. We also call for the lifting of the economic, commercial and financial embargo on Cuba. We also appreciate the recent pronouncements by some nuclear weapon states on their intentions to reduce their nuclear arsenals. Let us take up this new momentum and utilise the opportunity of the 2010 Review Conference to recommit ourselves to the full implementation of obligations under the Treaty on the Non-Proliferation of Nuclear Weapons. We should ensure a balance between the objectives of disarmament, non-proliferation and the peaceful use of nuclear energy. For Africa, the impact of climate change is devastating, and will severely undermine development and poverty eradication efforts. We need to act now to ensure that there is an inclusive, fair and effective global agreement on this critical challenge. The agreement must recognise that solving the climate problem cannot be separated from the struggle to eradicate poverty. Developed countries bear the greatest responsibility for climate change and its impact. We must therefore strike a balance between adaptation and mitigation. Our goal should be to significantly reduce emissions across the globe without constraining development in the countries of the South. Developed countries must make ambitious, quantified, and legally-binding emission reduction commitments that are in line with science and that address their historical responsibilities. At Copenhagen there needs to be agreement on new, additional, sustainable and predictable financing for adaptation. This should be for programmes that reduce the vulnerability of developing countries to the effects of climate change. In a world that is increasingly inter-connected and inter-dependent, international problems can only be effectively resolved through multilateral cooperation. The UN must continue to be at the centre of multilateralism. But it needs to be reformed if it is to carry out its mandate effectively, efficiently and transparently. We remain committed to the view that no reform of the United Nations can be complete without the fundamental reform of the Security Council. It must be representative of the international community and must reflect the geopolitical realities of today. If the UN Security Council is not reformed, and does not have permanent representation for Africa, the legitimacy of the Council’s decisions will continuously be questioned. As South Africa, we continue to advocate for an expansion in both the permanent and non-permanent categories of membership. Let me express our appreciation to the world for the celebration of the inaugural Nelson Mandela Day on 18 July this year. Scores of people engaged in a minimum of 67 minutes of voluntary action in the service of humanity, in honour of our icon, President Mandela. 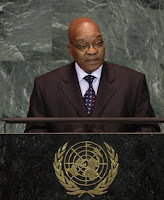 The Non-Aligned Movement has joined the call for this General Assembly to declare 18 July as Nelson Mandela Day. This is in recognition of President Mandela’s contribution to the struggle for democracy and the cause of humanity, and to promote community service across the globe. In this regard we hope that the General Assembly will adopt a consensus resolution in support of Nelson Mandela Day. South Africa is privileged to host the 2010 FIFA Soccer World Cup in the middle of next year, which will be the first time that the tournament is held on African soil. We look forward to hosting the peoples of the world, who will enjoy unique African hospitality and vibrancy. I wish to take this opportunity to thank the outgoing president of the General Assembly for his leadership of the 63rd session of the Assembly. I thank the General Assembly and Your Excellencies for the opportunity to address this esteemed gathering. Working together as a global family we can do more to create a better and just world.